We have successively developed PC software packages such as DAQ32Plus, DAQLOGGER, and DAQEXPLORER to support recorder products. These software packages are low-priced and easy to install, however there have often been cases where they could not consistently provide solutions for the various demands from respective users. Focusing on these software packages as key components, we have newly developed a set of flexible software for network-based solutions. This software set facilitates the creation of sophisticated combinations of software components by using enhanced software-to-software communication for exchange of information, such as various measurement channel and display- related items, as well as measured data. Moreover, utilizing the features of the existing software packages, this software set can provide solutions by combining software components with minimum modification. YOKOGAWA has successively released the DARWIN series (DA100/DC100/DR130, 230, and 240) as network- connectable data acquisition instruments, the DAQSTATION DX series as key industrial recorders, the MobileCorder MV series as measurement recorders, and the DAQSTATION CX series, a new product that comes with a PIC control function in addition to having the functionality of the industrial recorders. These instruments are not only connectable to a network but are also actively equipped with a variety of network-based functions, with the keyword "paperless" denoting the convenience of network connection. 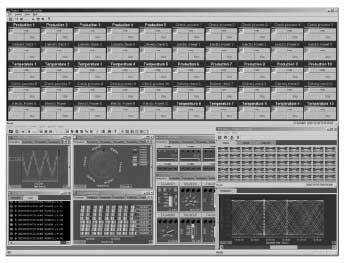 The PC software packages running in combination with these instruments are assuming increasingly growing importance in perspective of improving the ease-of-use for equipment configuration as well as increasing the efficiency of processing data acquired by the instruments. Moreover, their important is also becoming valued in the viewpoint of widening the range of providing solutions by being combined with the hardware. With the diversity of user needs, cases where the current PC software packages cannot always provide customer-specific solutions are on the rise. This is because they have been developed specifically for the corresponding instrument. Therefore, this time, we have developed add-on software (Add Series) that can be connected to these package software components to broaden their application range. Moreover, we have also developed gate software (Gate Series) that transmits data from a different model to the package software (the different model here means equipment not directly supported by the package software). 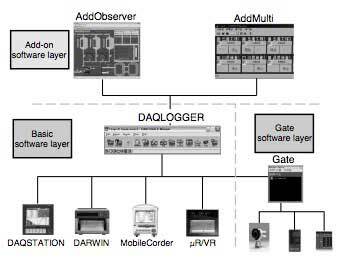 This paper outlines the add-on software and gate software, focusing on DAQLOGGER. This section describes the basic objectives in developing this software group. The time taken to start operating the equipment is shorter because there are less setup items in comparison with system configurator tools such as SCADA, and no development work is required. Operability becomes poor due to too many functions. Programs become large in size and complicated, resulting in a decrease in the running rate and an increased possibility of the occurrence of problems. The time required to realize the functionality becomes longer because the same function needs to be installed into multiple packages. To grapple with this dilemma, the target for the development of this software group was established as the "extension of a set of software that broadens the range of providing diverse solutions while maintaining the advantages of the package software". Adhering to this target, we have developed software components with various functions relating to the existing package software, while retaining the functionality of the existing package software unchanged. Figure 1 shows a typical system configuration built around DAQLOGGER. As shown in the figure, this software group consists of three parts. The add-on software layer, positioned at the highest level, consists of software components for adding functionality not supported by the basic software such as DAQLOGGER. They are designed such that the user can add them as necessary. The group of software belonging to this layer is called Add Series. 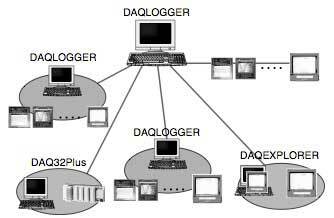 The basic software layer to which DAQLOGGER belongs is comprised of the existing package software. This basic software group realizes functions in combination with the relevant hardware in the conventional manner. Users can purchase and use these software packages only, if their needs are adequately satisfied in the range of solutions the packages provide. If a function is to be added after purchasing the basic software packages, the user can buy the above-noted Add Series software as necessary to enhance the overall functionality. The gate software layer, positioned at the lowest level, consists of software functioning as if it were a driver program, playing the role of supplying data from a different model to higher-level software. This gate software group can be used if the user wishes to handle a model not directly supported by the basic software. It is capable of acquiring a variety of information associated with hardware data on the server side (data units, channel- specific information such as tag names, display scales, and display-related information such as display group information). It has a mechanism in which protocol version information is embedded in packets, allowing the client side to run in accordance with the version of the server (compatibility retention). It has a mechanism to send and receive measured data and image data. It has an arrangement in which FIFO buffers are adopted for measured data and alarm data, preventing data omission. It has a mechanism capable of sending and receiving data from different equipment through a single connection. It has an arrangement in which the client side responds to actions on the server side (start/stop). It has a simple mutual authentication function to provide an arrangement that eliminates communications with different software. It has a software license certification function. As noted previously, this layer consists of the existing package software. Under current circumstances, the number of software packages belonging to this layer is three: DAQLOGGER, DAQ32Plus, and DAQEXPLORER. Naturally, these software packages are capable of achieving functionality singly. The core of this software group is DAQLOGGER. When seen singly, DAQLOGGER is logging software supporting up to 32 units or up to 1600 channels of the μR, VR, DARWIN, DX, MV, and/or CX series simultaneously. It is equipped with a wide variety of functions such as data monitoring, conversion into files, re-display, automatic conversion, FTP transfer, and e-mail transmission. In addition, it also has a server function capable of transferring internally stored measured data and a client function capable of receiving measured data from another server. The server function transmits data DAQLOGGER acquires to an external device, while the client function handles data acquired by another server in the same way as data collected from DX recorders, etc. Being equipped with these two functions, DAQLOGGER is capable of building a system in a hierarchical configuration using multiple DAQLOGGER components or of being used in combination with DAQ32Plus and DAQEXPLORER. Figure 2 shows an example of a system combining components of the basic software, centering on DAQLOGGER. The use of these types of combinations allows the following system extensions to be made according to the user's circumstances. A system can be built incorporating the existing system, without modifying it. Contrarily, both DAQ32Plus and DAQEXPLORER only have the server function and are capable of supplying data to DAQLOGGER or to the add-on software described in the following. AddObserver consists of a builder program used to develop a monitor screen needed by the user and a runtime program that performs data monitoring using the developed screen. The builder program has the advantage of creating a screen without using any other programs. The user can easily create any screen and operate it by using the runtime program. The AddObserver comes specially equipped with the function of assigning channels and easily setting up a display method based on server information exchanged in communications between software components. These functions contribute to improved user operability. Figure 3 shows the AddObserver builder Screen. AddMulti has a maximum of 50 data acquisition groups, and is capable of acquiring asynchronous data on a group basis. For example, if multiple asynchronous data is acquired using a single device, AddMulti assigns measurement channels to groups in units of synchronous acquisition. This software is useful if you wish to save data in files for each group or change the timing of data acquisition. For setting the start and end of acquisition on a group basis, AddMulti offers a trigger function activated according to the contents of measured values and a trigger function activated based on alarm status. Thus, it is also capable of automatically repeating data acquisition according to the user's preset conditions. Moreover, it also has as standard, the function of automatically converting acquisition-completed files into a different format such as Excel. Figure 4 shows the AddMulti Operation Status. This software is being planned for development in order to implement extended trigger functions. It will be able to start and stop data acquisition using an alarm or another event as a trigger, while long-interval data acquisition continues to be handled by the basic software. Thus, it will be useful if the user wishes to acquire only the data needed. This software is also being planned for development as one integrally controlling data acquired by this software group or by the DX, CX, MV, and/or DARWIN series. All software components in this layer have a data transmission function (server function). They acquire data collected by a different model (the different model here means equipment not directly supported by the basic software) and supply it to higher-level software. Some pieces of the gate software have been developed so that they run as service programs of Windows due to their functional characteristics (driver-like functions). They are also designed to support multiple instruments simultaneously, so that requests from multiple clients can be responded to. GateEye supplies the image data of a network camera to higher-level software. The use of GateEye allows image data to be displayed together with measured data. Network cameras supported by GateEye must be provided with the function of sending JPEG-format still images based on HTTP (hypertext transfer protocol). GateEye also supports snapshot images, a function equipped by the DX, MV, or CX series as standard. It assumes AddObserver, DAQLOGGER, and the remote monitor of each basic software component as clients, and offers the function of monitoring measured data and image data simultaneously. GateOPC is equipped with an OPC client function, so that it is connected to a variety of OPC servers to receive data from an OPC server and transmit that data to a client. If there is an OPC server supporting equipment the user wishes to use, the use of GateOPC allows the basic software to handle data acquired by such equipment. This software is useful in building a system consisting of many pieces of hardware not supported by the basic software. GateMODBUS has a MODBUS master function and uses the MODBUS protocol to acquire instrument data to supply it to the basic software. This software is expected to significantly expand the range of hardware that can be handled by the basic software because there are a number of instruments/ equipment supporting the MODBUS protocol. This paper has described the extension of the PC software packages that expand the range of providing solutions by combining various recorders and PC software packages over a network. We expect that combinations of the three-layer structured package software group will enable diverse solutions to be provided for more users, increasing awareness of the advantages of this innovative software group. Windows and Excel are the registered trademarks of Microsoft Corporation. 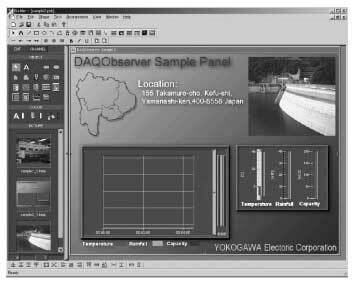 DARWIN and DAQSTATION are the registered trademarks of Yokogawa Electric Corporation. The company names, product names, and brand names in this report are trademarks or registered trademarks of their respective owners. The DR130 can record data in 10 colors from all measurement points at 2-second intervals. It has a variety of recording functions including analog trend recording over an effective recording width of 150 mm, recording of digital measured values, recording of various messages, zone recording, and partially compressed and expanded recording, thus enabling data to be read off speedily.